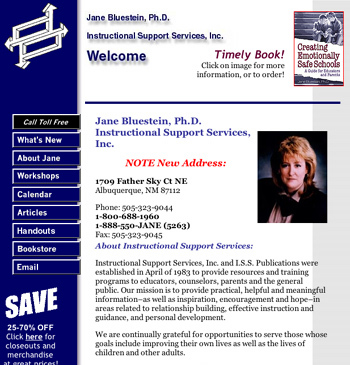 History of Instructional Support Services, Inc. I was working full-time at the University when I started this business, though by 1985, I was no longer even teaching classes there. In 1986, I was joined by my husband, Jerry Tereszkiewicz, who left the construction work (which had basically paid the bills and kept us fed while I was getting the business off the ground) to work with me full-time. Meanwhile, I concentrated my time on my writing and building my speaking resume! 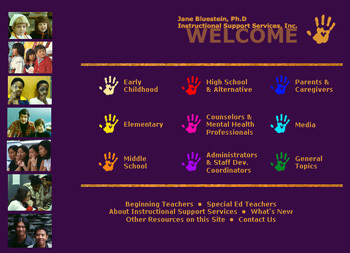 Between traveling, writing, distributing not only my own books and resources, but also about 300 other resources from 50 other publishers— plus learning all the “business stuff” you don’t generally pick up when learning to become a teacher, the confusion and challenges I saw in my logo (above) seemed particularly appropriate. I was, at that time, beginning to do more international work, taking a whole lot of computer classes, and writing a new book every year or two. But our next big priority was getting online! I set up a site in 1997, and after hiring two different people who never bothered to follow through on building the thing as they had promised to do, I figured I may as well just do it myself. A new ISP and web host, and a few intense lessons with GoLive (the web-development software I used to create my first site) and I was on my way. 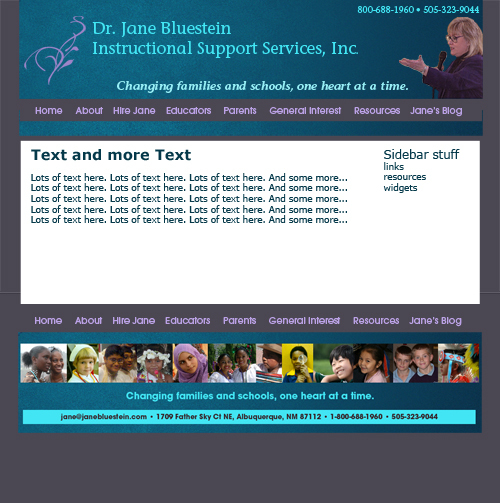 The image on the left is a screen shot of my home page as I’m typing this (Sept. 2003). I’ve switched to a dedicated Web hosting service, and will continue pointing visitors to the old site until this new one— including the page you’re currently reading— is complete! 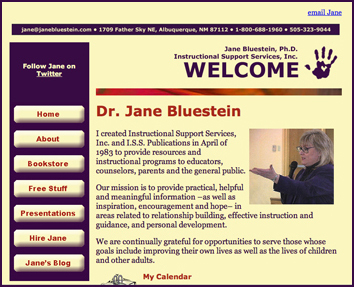 This site worked well, but by the beginning of 2002, I felt like it needed a bit of a makeover. A new logo, new colors, new layout and a few Web design features I hadn’t known about previously entered the picture. Looking back on the old site, I’m grateful for the help I had to get started. It really worked and, to me, is still a very nice graphic design. So I guess I needed to include this page, and these graphics, to honor what was. Interestingly, after years of building the business up, I find myself now slowing down, walking a narrower path, and being a lot more focused in the work I’m doing. To see where this path leads, check on what I’ve been up to from time to time on this site. It’ll be a good place to see what new kinds of history I’m making! I’ve had a blog running on this site for 11 years now, and now have a new version of this site to present to the world. I “finished” this history five years ago, just as I was about to launch the second version of the site. 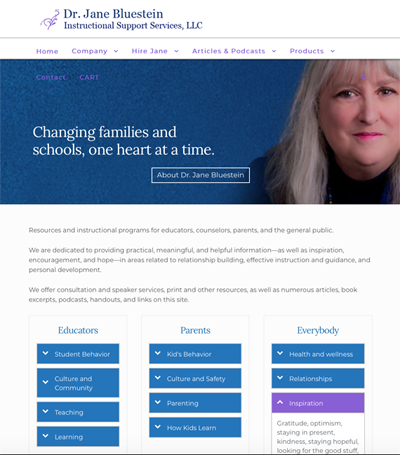 It looked like the image below and was designed to eventually evolve into nine separate sections, one each for early childhood, elementary, middle school, high school and alternative, counselors and mental health professionals, school administrators and staff development coordinators, parents and caregivers, the media, and the general public. 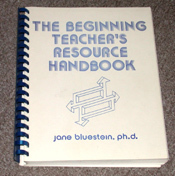 I also had links for special education professionals and beginning teachers. But once I started putting the sections together, with individual indexes for each, a couple of things happened. First of all, I realized that almost all of the material I had was almost equally appropriate for anyone working in a school environment (including beginning teachers and special education teachers) and in most cases, for parents and other caregivers as well. Second, almost everything I added fell into this category, being relevant for anyone working with kids of any age. Recently, I hired someone to do an analysis of my site and give me a hand with search engine optimization and it turned out that despite the wealth of free and valuable information on the site, and despite its longevity, the site was coming up with the worst possible page rank and frankly, not getting anywhere near the traffic it should. So, I started looking at ways to make improvements and as so often happens, I ended up in this “well, as long as I’m changing this…” loop and ended up with a total renovation! I am following suggestions of someone whose opinion I value to move in this current direction, but keep in mind that the revision to the second version of the site followed suggestions that ended up not really serving me, so I suppose it remains to be seen what happens now. Either way, there is one more thing that I had to consider before undertaking the overhaul of more than 600 pages: The second site was constructed using frames and a whole lot of tables which, as one young designer said, is so 2003! Sheesh! So FINE!! I’ve learned some more CSS (cascading style sheets) to create a more current version of the site structure. Please don’t even bother to tell me how outdated it already is, OK? I’m keeping up as well as I can! So the history of this site now takes us up to my being about a third of the way through its third rendition. Unlike the last overhaul, in which I waited until the site was done to launch the entire thing, I have already uploaded the finished pages, so what we have at this moment is a hodge-podge of old stuff and new. The old color-coded frames (with the beautiful composite photos for each) are gone. Perhaps I’ll add screen shots of the pages to some future gallery, but their presence just complicated things and they really don’t fit anywhere in the current navigation scheme. And frankly, I don’t believe that many people were using them anyhow. I’ve renamed a few things, and moved a few others, which will be a problem for anyone who has bookmarked these pages, but I’m hoping that people will head for my new home page and find their way from there. In the meantime, there may well come a time for me to turn this site over to someone much more technically savvy than I, but for the moment, this is something I enjoy doing and hey—it’s FREE STUFF, lots of it, so please bear with me during the renovation and enjoy it for what it is, in any way this material may be helpful to you, your kids, your colleagues, your family, or your school. So this is a good time to reflect on the growth and development of this company since my last entry here, because a lot of history has happened in the past three-plus years. I turned 60 last April and as many of my former colleagues had long since left their teaching positions, thoughts of retirement started dancing in my head, too. Funny, though, how quickly these ideas got crowded out by all kinds of new products and projects I suddenly wanted to do. Books: I did three more books for Corwin— four if you count The Win-Win Classroom, which I didn’t even mention above. (It came out in 2008.) In addition to a Facilitator’s Guide, I wrote a book for beginning teachers (and the people who work with them) called Becoming a Win-Win Teacher, and more recently, edited a compilation of chapters from nine different books for Best of Corwin: Classroom Management project. “Pads” on the Back Templates: As we started to run low on our stock of “Pads” on the Back, we decided to offer them as a downloadable template. I created the template in response to a request for a Spanish-language version and in the ensuing months, found people gracious enough to translate the template into their native language. (Well, I suppose that would not be exactly true for the Latin version, but you get my drift.) We initially charged $4.95 for the download, but then decided, in the spirit in which the product was developed, to simply offer them for free. To date, we have the template available in 24 languages and I continue to scout translators for more. eProducts: I started offering more and more of our other products as downloads. In addition to putting the contents of the TeacherTapes online as an mp3 download, you can now get The Book of Article Reprints as well as individual articles in PDF form. Look for more ePubs, maybe even in eReader formats as I figure (or farm) this process out, as well as audio and, eventually, video files to become available on this site. Spectrum Podcasts: This project has taken over my life (not to mention the back room of my office). With support from my sponsors and friends at Energize Students, I have, to date, recorded six shows. I have another show scheduled to record this week and about a dozen other guests lined up (so far). I published two of the shows on this site just yesterday, and will have the third up before I go to bed tonight. Newsletter: Another just-starting-now project. I finally got my mailing list sorted out and exported and am working with book group friend and marketing expert, Lynne Marcus, to set up a regular monthly newsletter. I’m hoping to get the first one out by the beginning of March. website v3.2: I am in the process of hiring a prospective Web designer. I’ve talked with her on the phone and she’s looked at my site and wants to work with me. It doesn’t sound like she’ll have any trouble fulfilling the wishes on my wish list and depending on what she proposes when we connect later this week, this may actually be website version 4.0 (although I’m honestly hoping to keep a lot of the features from this current incarnation). I will try to remember to post a screen shot of the new site whenever it launches, presumably soon. So much for retirement. Ha! I’m back to doing the site and design myself. I wasn’t happy with anything the design person was turning in so I came up with the following on my own. It uses the colors from this current site (see previous photo) in a completely new layout and design. I liked it and thought it had potential. But then a strange thing happened. It may have had to do with some of the things my design person started doing to this layout (not good things), but I realized that I was getting a little tired of these colors. I liked the design, but something wasn’t quite working for me. This is where I am right now, trying to figure out how to get my WordPress layout to look like this. See my blog (July 2, 2012 and subsequent entries) for more details. As of early August, this design has undergone a few small changes as I discover things that are rather challenging to pull off in WordPress. I am currently in the process of building what will probably be a skeleton site, bare bones of what absolutely needs to be here before I can launch. Well, as you can see, I’ve made a good bit of progress on this site, and now have over 500 pages available. Many of these posts have new content, although most were converted from the old site. (I still have more than 300 pages and several sections to bring over, including all the posts in Spanish and French and all the Links sites). I realize that this will take some time, as I’m still working on the site in between other projects. I’m sure I’ll be very happy to announce that ALL of the pages from the old site have been converted one day, and in the meantime, will continue posting new stuff here at least every few weeks. The fact that there’s as much here as there is a bit of a story in itself. (Geek alert!) I switched my site design to WordPress, a Web-based “content management system” and blogging tool that uses different programming languages from what I had used on the previous sites, stuff I had studied but never really used, much less mastered. I spent the entire summer of 2012 and a good part of the fall struggling with tasks that, to me, should have been much, much simpler. Example: You know the photo bar at the bottom of every page? (You can see it in the illustration I created in Photoshop above.) Well, in an HTML site, I could plop that puppy right where it belonged with no problem at all. In WordPress, nothing I did, no code I wrote, would get that stupid footer to display properly. I spent weeks driving myself crazy and getting nowhere. I finally realized that I needed to make a choice between developing content that would help people or learning code I would probably only need to use once and promptly forget again. This was not as easy a choice as it may seem as I love learning new computer stuff. But I finally decided to surrender the under-the-hood work to someone who already knows it so I can get back to what I do best. I’m embarrassed at how long it took me to get to that point, but once I connected with Tom Todd, my WordPress Guy (and, at this point, good friend), he got the footer where it belonged (probably in about 10 minutes) and I was free to get on with my life. Since the 2012 entry, my speaking work dropped off and many of the people who had hired me in the past decided to retire. I decided to take advantage of the time at home, splitting my attention between all the projects mentioned above. The podcasts have continued, but they’ve slowed down, too, as my sponsor has been working on other projects and not posting as many as they had been. Nonetheless, I still have three in the can, as they say, and will probably resume recording as soon as they are posted. I’ve written a number of new pieces for the site or various publications, reorganized my handouts, revised my presentations, and prepared an ePub version of Magic, Miracles and Synchronicity, which is pretty much ready to send off. Early in 2013, I was invited to co-author a book on perfectionism with an author whose speciality was gifted teens. I agreed on the grounds that we opened the market beyond this initial focus. With everyone’s apparent support, I spent the next 9 or 10 months exploring everything I could find on the topic. The workload was unbalanced, however, and the writing process just wasn’t working. In the end, I opted out. The work and interactions were just getting way too stressful and counterproductive for me. Around that time, I got a call from a former editor from Corwin, now working with ASCD, asking if I ’d be interested in writing a 10k-word booklet on classroom management. It was just the assignment I needed and within a week or two, had my first draft ready. A few tweaks to the format and content, and in February of 2014, Managing 21st Century Classrooms was released! A little note here: People who have been following my work for a while will remember a book that first came out in the 80s called 21st Century Discipline. In 2007, after writing a 3rd edition for Corwin Publishing, I learned that I had lost the rights to the title. I blogged throughout this tumultuous and difficult time, which happily ended in a new series that started with The Win-Win Classroom, instead. Although I had long ago let go of the old title (and concept), I must admit that having a book come out with the words “21st Century” in them— a title suggested by my contact at ASCD— represented the closing of a karmic loop for me. Brilliant, really! In another interesting (karmic) development, at the end of 2013, I reconnected with yet another one of my former editors. She’d taken some time off to raise her kids and was now back with Health Communications, the publisher of five of my books and the one I’d wanted to have publish the perfectionism book from the beginning. When I mentioned the fact that I’d been researching the topic for most of the past year, she immediately expressed an interest in it, and in April 2014, I signed a contract to do a book on perfectionism, this time, on my own. An invitation to present to a group of Montessori teachers from 15 schools in the San Diego area turned into a road trip, one that reminded me of how much I love presenting and also how much I love doing road trips with Jerry. We had a wonderful time and the Montessori people were, as always, fantastic! Another road trip opportunity came up when we were invited to our niece’s wedding in northern Virginia plus an opportunity to present a 3-day seminar in Rockville, Maryland the following week. We spent four weeks driving around the country with these two events breaking up the trip in the middle. I’ve been home for about 10 days, much of that time devoted to getting ready for upcoming jobs in Kentucky, Georgia, and New York. And no, I haven’t really started on the new perfectionism book yet, although I’ve also been looking over another hundred or so pages of quotes, interviews, articles, and posts about perfectionism, coding them to file according to topic so I can actually start writing when I get back at the beginning of August. I’m currently using the same outline I had developed when I thought I would be co-authoring this book, as that list is extremely comprehensive and at least gives me a place to put everything. I’ve been a bit overwhelmed by how many different possible angles this topic covers and am not exactly sure where I’m going to begin— or how much of this content I can really address in the 250 pages my editor wants. I think I’ll feel a lot better about this project once I nail that first workable sentence and feel like I have a thread to follow. I will update this project as it unfolds. Instructional Support Services, Inc. has reverted to a sole proprietorship (LLC) and many aspects of the business will be coming out under one of the subsidiaries of Father Sky Industries. I have made the difficult decision to close the store and get rid of our inventory. Many of our products are currently being offered for the cost of shipping and are otherwise free. I am going through the 500+ pages currently on this site and still importing posts from 2 site versions ago. I am reorganizing some of the content and updating links, getting rid of internal “targets” that would open pages in the site in separate pages. Stuff like that. This is tedious work, but it should make the site a bit easier to navigate, and will certainly bring the protocols up to date (at least as they stand right now)! I am also concentrating on getting some older stuff into eBook format to keep them available whether I’m working (or even around) anymore or not. I am still speaking when the phone rings and it feels right, and I am still clearing and cleaning and organizing the stuff I haven’t gotten to during the purge of the past few years (or the stuff that has since started piling up). Further updates are included in my (more or less annual) blog pages as well as in the timeline of highlights and milestones in my life and career.